Flat-bed industrial sewing machine: flat bed sewing machine is the most common sewing equipment can be found in all sewn product manufacturer. Cylinder bed (cylinder arm or free arm) industrial sewing machine: mostly used to reach into smaller places where a flat bed sewing machine is just not practical, for example sofa covers, car seat covers, saddle & harness, shoes & footwear, luggage & suitcase, hand bags, purses, golf bags and orthopedic products. 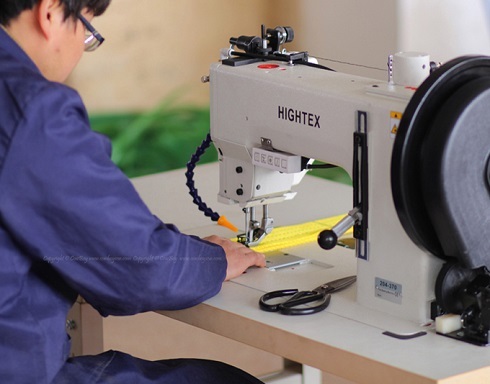 Post bed industrial sewing machine: post bed machine is particularly suited for shoe work, upholstery and other work which is difficult to handle on a flat bed or a cylinder bed machine. It has a very small top surface, which permits an operator to handle a shoe upper and leather piece conveniently while fitting the lining, without twisting the upper out of shape. In today's world many are using post bed sewing machines for decorative stitching on sofa covers, Seat Covers & Cushions, boot tops and luggage. Long arm industrial sewing machine: both flat bed, cylinder arm and post bed sewing machines, the length of arm can be extended for larger working space (clearance room) under the arm. Long arm industrial sewing machines are particularly suited for large or thick materials, such as sails, tents, tarpaulin, boat covers, parachutes, upholstered furniture and marine upholstery etc. Compare the presser foot lifting height of sewing machines, according to the thickness of your material. For easy loading and unloading (especial bulky material), the clearance under presser foot at least 3mm more than the thickness of your material, then you can move the material without any difficulty. Some industrial sewing machines have very high presser foot lift (over 20mm), but the needle penetration force is not very strong. When stitch extremely hard material (such as saddle leather, kevlar, plywood, plastic sheets and sailcloth), you have to check the needle penetration power with the professional who takes charge of your order. Obviously, the needle penetration force is dependent on a number of factors including: needle bar stroke, size of flywheel, needle bar movement (especial zigzag sewing machine). These factors cannot be improved, if you need an extra strong needle penetrating power for your stiff/hard material, you can contact HIGHTEX team for speed reducer, which can increase needle penetration power to 3-6 times!! Each machine equipped with certain needle system and needle size range, you need to select right needle system/size according to the thread sizes you are using. Sewing foot stroke is the major factor of climbing capacity of sewing machine. If you are to sew thick point or cross seam (for example topstitching overlapped corners of sofas covers and car seat covers), you have to check the sewing foot stroke of machine. Also you can consider the special Upholster Climbing Presser Foot designed by HIGHTEX team. Drop feed: drop feed (feed material by feed dog), this type machine is mainly used in apparel industry. 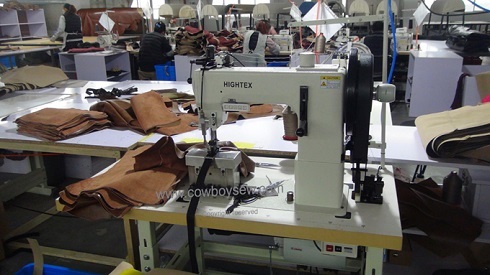 All garment manufacturers have drop feed lockstitch sewing machine. Walking foot (top & bottom feed or upper & lower feed): the drop feed (feed dog) and alternating (walking) presser foot feed synchronously, keeping all layers of webbing even and smooth while sewing them together. 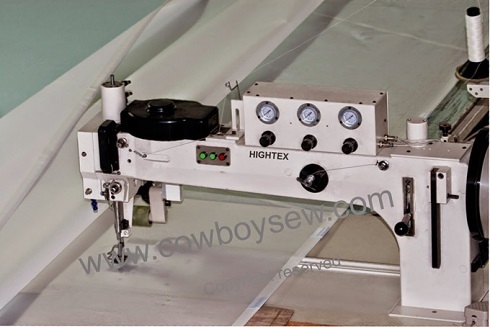 It is the basic machine for heavy duty sewing applications. Triple feed (compound feed or union feed): triple transportation is the most expensive sewing technology in today market. Triple feed sewing machines have two alternating presser feet which move the material by synchronizing the motion of the needle bar, the inside presser foot and the bottom feed dog. While the material is being moved (forward or reverse), the outside foot is lifted off the top of the work. This allows the needle, inner foot and feed dog to easily transport all of the layers together, until the preset stitch length is reached. Additionally, puller feed (a feeding device behind on the presser foot) is almost necessary when sewing large surface products, such as boat sails, spinnakers, parachutes, field covers, marquees and tents etc. Most industrial sewing machines have special sewing attachment / sewing accessories for different sewing applications. These special devices not only improve productivity but also can guarantee perfect sewing quality. Please check the sale engineer.